Loss of viability (Z score) resulting from HSP90 inhibition (HSP90i; ganetespib, 5 nM) in FANCA null GM6914 cells transduced with retroviruses encoding FANCA wild-type (squares; WT) or empty vector control (circles; null) in the presence (black symbols) of MMC (31.6 nM) or DMSO control (gray symbols). Data from three independent experiments are presented as mean ± SEM. Cell, 2017, 168(5):856-866. Ganetespib (STA-9090) purchased from Selleck. 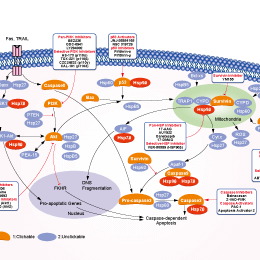 Breast cancer (MDA-MB-231), pancreatic cancer (PaTu2), lung cancer (A549), colon cancer HCT-116, and acute myeloid leukemia (SKM1) cell lines were incubated with increasing amounts of PU-H71 and STA-9090 as indicated. Western blot analysis with PRKD2, cleaved PARP, and cleaved caspase-9 antibodies is depicted. Cancer Res 2014 10.1158/0008-5472.CAN-14-1017. Ganetespib (STA-9090) purchased from Selleck. Western blot analysis of the expression of Brd4 and Hsp90 from whole-cell lysates of Pkd1 null MEK cells and Pkd1 mutant PN24 cells treated with STA9090 at indicated concentrations for 24 h (B), and in Pkd1 null MEK cells and Pkd1 mutant PN24 cells treated with STA9090 (200 nM) at indicated time points (C). Hum Mol Genet, 2015, 10.1093/hmg/ddv136. Ganetespib (STA-9090) purchased from Selleck. McCleese Jk, et al. Int J Cancer. 2009, 125(12), 2792-2801. Wang Y, et al. Curr Opin Investig Drugs. 2010 , 11(12), 1466-1476. Ying W, et al. Mol Cancer Ther. 2012, 11(2), 475-484. Lin TY, et al. Exp Hematol. 2008, 36(10), 1266-1277. Does this inhibitor inhibit both isoforms of HSP90? NVP-BEP800 : HSP90β-selective, IC50=58 nM. KW-2478 : HSP90, IC50=3.8 nM. 17-AAG (Tanespimycin) : Phase III for Gastrointestinal Stromal Tumors. 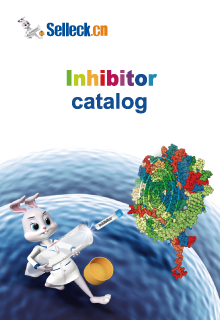 XL888 : ATP-competitive inhibitor of HSP90 with IC50 of 24 nM.